I’m going to try and interpret this ending as best as I can. On the surface, the ending seems strange, right? 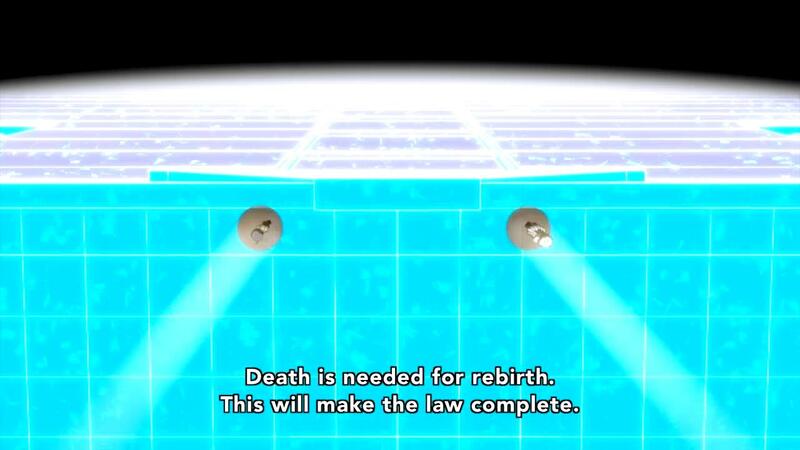 If the entire plan culminated in Namikoshi’s death, doesn’t that make the plan a success? Why would the ending be celebratory if Namikoshi ended up getting what he wanted? I’m assuming the idea was that Namikoshi’s death was meant to get Akechi to enter the circle of hatred that is Twenty Faces. 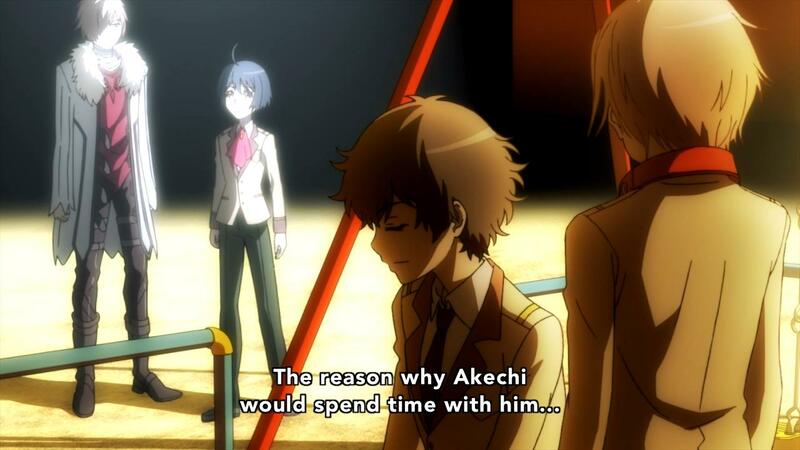 However, the fact that Akechi fought against this plan to the very end resulted in what could be called a failure. That being said, though, there’s one piece of the ending that doesn’t quite add up for me. If the plan was to spread the message of Twenty Faces, how was that not accomplished? I understand the plan to turn Akechi failing, but shouldn’t the propagation of Twenty Faces have succeeded? Why were things quieting down after the incident? It seems like an inconsistency to me. All in all, I would judge this ending as somewhat weak. 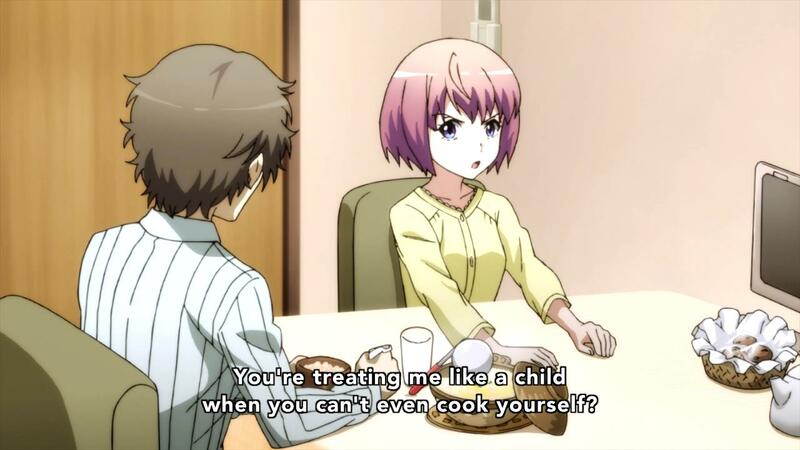 I get that the show was trying to question the idea of justice in society, but I wish Namikoshi wasn’t ultimately portrayed as child who really wanted Akechi-senpai to notice him. I think something that would have made the ending more interesting is if the disappearance of Namikoshi’s body had been planned as a way to immortalize his ideal, but no such luck there. That being said, I would say the show was interesting enough to bring me in and asked some decent questions, so I’d put it in the higher end of shows this season (I don’t expect much agreement on that, though). This week’s episode was pretty slow…the entire episode is devoted to the captured Kobayashi hearing the story of the Twenty Faces. I’m honestly not sure how much his story actually contributes to the show. We already know that he was heavily abused from the story that Akechi gave…it’s not a huge stretch to conclude that he had a rough home life as well. That’s why I’m curious whether there was something else I was supposed to conclude this week. Maybe it’s something about his statement at the end about sacrificing Kobayashi? Ranpo Kitan – Game of Laplace Episode 9: Final showdown is coming? This week’s twist isn’t totally unexpected…the series has already suggested that Twenty Faces was the main enemy for the series, so it made no sense that Akechi would figure out how to defeat it two episodes before the end. Also, self-immolation is a way to cover up DNA evidence and the mask brings anonymity, so there was no concrete proof that Namikoshi had died. That being said, I definitely didn’t suspect Minami as this episode’s Twenty Faces distraction. There were two pieces of this week’s episode that I didn’t fully understand, though. First was Hashiba’s transformation into a silhouette in the eyes of Kobayashi…was that meant to suggest that Hashiba had drifted too far out of Kobayashi’s circle that he was no longer readily recognizable? 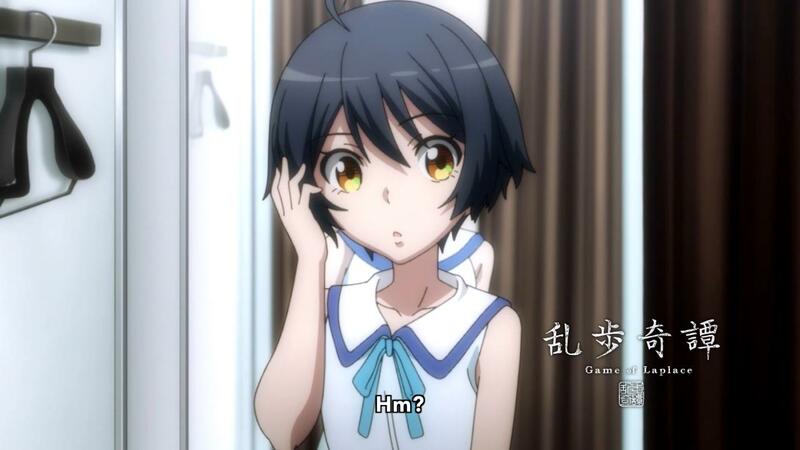 Or did it mean that Hashiba had now turned into a suspect. That scene also relates to the second thing…the hand that grabs Kobayashi near the end of the episode. Was it Hashiba? Or some other Twenty Faces sympathizer? I really hope Kobayashi doesn’t turn into some sort of damsel in distress for Akechi to save. That doesn’t seem interesting. I do like the rivalry between Akechi and Namikoshi, though. Though, what is going on with the formula? Did Namikoshi evolve the formula further? Author marthaurionPosted on September 4, 2015 Categories Ranpo KitanTags game of laplace, mysteriesLeave a comment on Ranpo Kitan – Game of Laplace Episode 9: Final showdown is coming? Ugh…I’m so upset with myself. I convinced myself that they couldn’t possibly solve the mystery in the first five minutes of the episode because of the letter of challenge from Twenty Faces. If I hadn’t done that, my suspect would have been the girl…now it’s too late. The reason that she was most suspicious last week is that she’s the only one at the scene that didn’t provide any information helpful for the case. The culprit aside, though, this week’s episode also finally gives Akechi’s connection with Twenty Faces. I think I’ve said before that it’s really likely that Twenty Faces is being controlled in the background by a single person, but it looks like it’s actually a program designed to dispense justice. It’s an interesting concept and we can finally see why Akechi is so obsessed with catching every one. That being said, where does it all end? The original Twenty Faces that kicked everything off has died, so is there really any way to stop an urban legend? Or will Akechi end up forever chasing these new Twenty Faces cases? Ranpo Kitan – Game of Laplace Episode 7: No culprit yet? Wait…people get excited about locked room murders? I feel like they’ve become so commonplace in murder series these days that I find them boring. Anyway, as expected, Twenty Faces has become a recurring phenomenon in this series and will likely be the focus for the rest of the show given the time remaining. My suspicions are the same that someone is in the background pulling the strings for these murders, but we’ll have to see. Author marthaurionPosted on August 14, 2015 Categories Ranpo KitanTags game of laplace, mysteriesLeave a comment on Ranpo Kitan – Game of Laplace Episode 7: No culprit yet? So I guess this week’s episode counts as filler, right? I suppose it’s just letting things cool down from the Twenty Faces incident? I’m also wondering if the episode also intends to somewhat clear Shadow Man from the incident at the end of last week’s episode (killing the fat man for Sachiko’s sake). That being said, most of the events of the episode ended up being really boring to watch despite how zany they were trying to be. I assume next week will pick up again with more Twenty Faces investigations. As expected, Kagami wasn’t truly behind Twenty Faces…I’m still running with my theory that the real one finds people in vulnerable states of grief and convinces them to take justice into their own hands. I’m not convinced yet that this switch from random murders to a main “villain” of sorts is a good idea for this show…it seemed so much more interesting in the first couple of episodes. I’m really upset about this week’s episode. Not only was the entire episode spent on Kagami’s past, his story ended up being really generic for vigilante killer. Basically, he was a bright-eyed detective who had his sense of justice corrupted seeing the legal system fail to protect the one he loved most…thus, he took the law into his own hands. I’ve sometimes wondered whether I would do the same thing in his position (I’ve been fortunate enough to dodge that scenario). Still, does the legal system really allow the insanity plea that much? Ranpo Kitan – Game of Laplace Episode 4: What exactly am I watching in this prison? Author marthaurionPosted on July 24, 2015 Categories Ranpo KitanTags game of laplace, mysteries2 Comments on Ranpo Kitan – Game of Laplace Episode 4: What exactly am I watching in this prison? 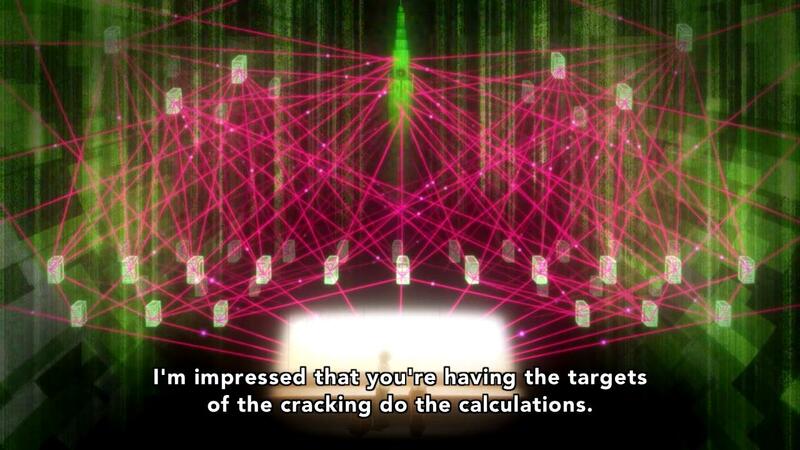 Ranpo Kitan – Game of Laplace Episode 3: Going too far? In general, the third episode for a given anime is meant to be a crossroads of sorts, an episode where most people decide whether they will continue or drop. Overall, I thought that this third episode was actually pretty weak, which was upsetting to me because I actually quite liked how the series was going. I don’t think that this episode should have been a one-off mystery…it just felt off. Plus, there was practically no mystery in this episode…the culprit was revealed pretty much instantaneously. They must have really wanted this one to hit hard…there was way too much of a tragic story given for this random girl that survived a seemingly terminal illness. 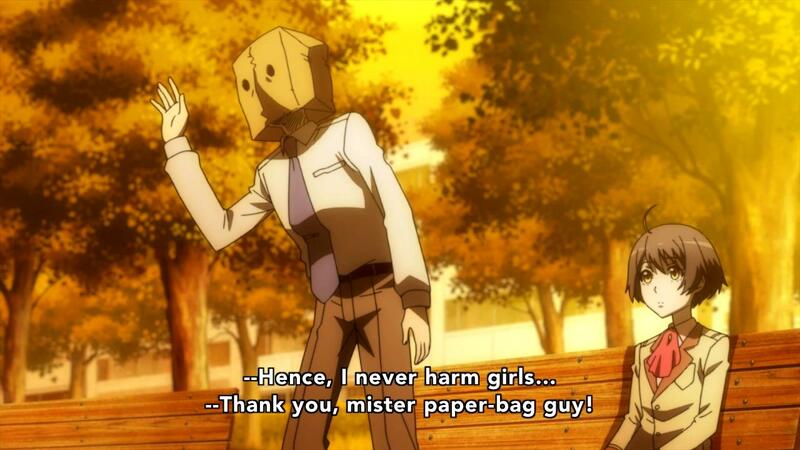 So the episode ends with a quick cut to some faceless person reaching for a mask. Is this person going to be a main antagonist for the show moving forward? The Moriarty of the show, perhaps? Maybe that means that the show will start kicking into gear soon. Final note: I think this episode complicated my predictions a little bit…now I can’t expect everything to be wrapped up neatly, so I might have to get a little creative with how I guess a story will go. I can accept that, though. Author marthaurionPosted on July 17, 2015 Categories Ranpo KitanTags laplace, mysteriesLeave a comment on Ranpo Kitan – Game of Laplace Episode 3: Going too far? Ranpo Kitan – Game of Laplace Episode 2: More mysteries! And so the mystery comes to an end pretty quickly. 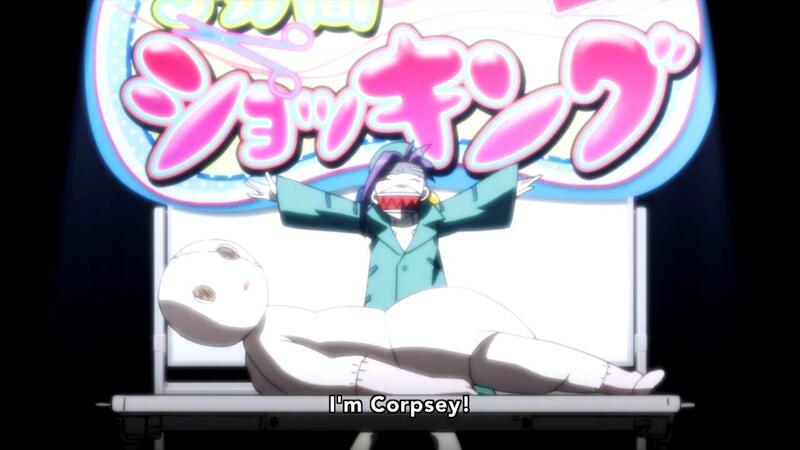 It actually wasn’t that surprising given that the ME finishes her autopsy by saying “see you in two weeks”, meaning that a new body will need to be examined in two episodes. I’m actually a little disappointed in myself for not suspecting the three students that ask about Kobayashi being taken into by the police (the culprit turns out to be one of them). I should have been more suspicious of their questioning and the fact that they weren’t silhouettes like the other students. I got too distracted by the teacher’s lousy acting when discovering the phone…it actually made her the suspect in my eyes. I didn’t realize that she was helping solve the crime. I still think this show is interesting. My current working strategy for the next mystery will be to suspect all of the revealed characters, especially the ones that are revealed but not yet named. I can’t imagine they’ll make it so easy next time, though…right? Well, call me a sucker for mysteries, but I’d say this series has me on board. I’m really looking forward to how these mysteries turn out. Also now that Kobayashi is somewhat accepted, does this mean we get to learn more about who Akechi is? A good detective usually has his quirks, right? Author marthaurionPosted on July 10, 2015 Categories Ranpo KitanTags game of laplace, murder mysteryLeave a comment on Ranpo Kitan – Game of Laplace Episode 2: More mysteries!